I have seen people with severe traumatic injuries to their eyes from every possible cause you can imagine: knives, guns, pencils, fists, fireworks, Christmas stocking holders, tennis court net cranks, lasers, bleach, acid, fire, baseballs, hammering, bailing wire, you name it. But, surprisingly, I have seen more patients with severe eye injuries due to bungee cords than any other single mechanism I can think of. Who would ever guess these seemingly innocuous, sort of fun-to-play-with, colorful little devils could be so dangerous? The common story is something like this: "I was tying something down with a bungee, and the hook snapped off, and the other end came flying and hit me right in the eye. I immediately couldn't see with that eye, and it hurt like crazy." Just earlier this week, on call, I took care of a person to whom this exact thing had happened. Thankfully, they were wearing glasses. The glasses shattered, and the eye was damaged -- in fact, part of one of the muscles that control eye alignment and movement was literally torn off the eye -- but the eye didn't rupture. I took care of another patient who developed a significant bleed inside his eye -- known as a hyphema -- because of a bungee cord injury. Check out this photo, from EyeRounds.org. Note the small little sliver of red in front of his brown iris? Those are red blood cells floating around because the eye is bleeding on the inside. 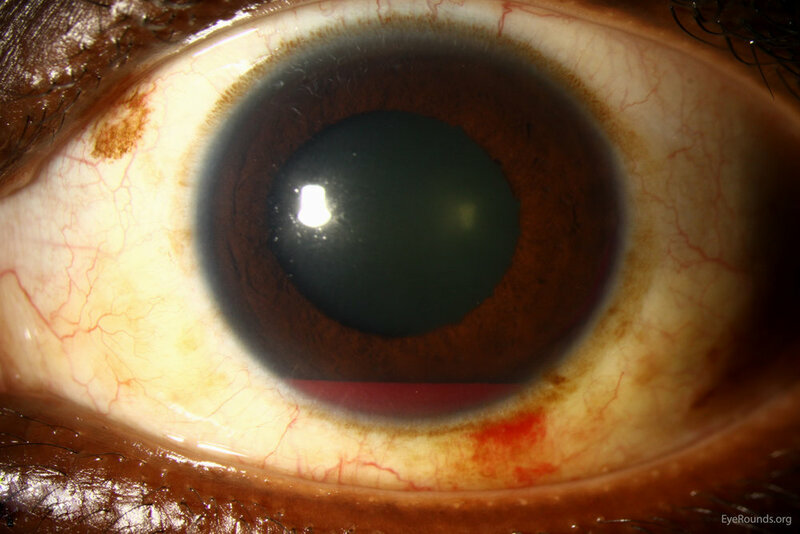 Although my patient did great, hyphema can cause high pressure and permanent vision loss. Yet another patient of mine wasn't so fortunate. The bungee cord struck his eye with such force that it tore the eyeball open. This laceration was repaired surgically, but the eye never regained vision, became painful, and eventually was surgically removed. My kids, when their friends are over and they see the bungee cords in our garage, know the line: "Daddy says we aren't allowed to play with those." Friends, don't let your children use these, and when you yourselves must, be VERY careful!